Secret video shows life in IS stronghold Jump to media player As the UK launches air strikes in Syria, the country's information minister criticises the decision. Syria plane 'bombs petrol queue' Jump to media player A Syrian government plane has attacked a petrol station in the north-east of the country, killing at least 30 people and injuring dozens more, according to opposition activists. 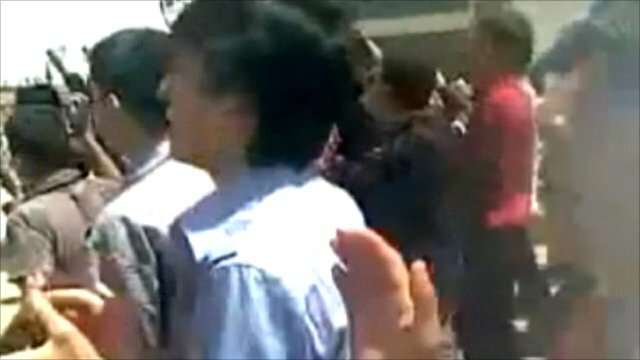 Amateur video of Raqqa protests Jump to media player Protests erupted in several Syrian towns and cities on Friday as widespread anti-government unrest continued. In January 2014 a brutal new jihadist group swept through Syria and set up its capital in Raqqa in the east of the country. In the two years since, so-called Islamic State has evolved into the most notorious extremist group in the world. For the past three months Today programme correspondent Mike Thomson has been in sporadic contact with an activist based in Raqqa from a group called Al-Sharqiya 24. He has been keeping a diary of what life is like under Islamic State. We have changed some details of his story, read by an actor, to protect his identity.